Thousands of people have read my essay The Transformative Power of Climate Truth through the years, and I have updated it several times. See the most recent iteration, including an analysis of Trump, the breakthroughs in the Climate Emergency Movement, and more. Available on medium here. Before starting The Climate Mobilization, I was training to become a clinical psychologist. Psychology was the first lens I used to examine my own and others’ responses to the climate crisis: grief, terror, denial, dissociation and more. My most impactful writing has been on the psychology of the climate crisis. In January, I started a psychological discussion series, with the goal of creating a fellowship with others who are grappling with climate truth as they go through their lives every day. The discussions will open to all Mobilizer Backers — The Climate Mobilization’s sustaining donors. These 90 minute monthly calls will be a time to share and learn about the under-discussed personal, emotional side of the climate crisis. The format will vary, but the basic questions we will explore will include: What is it like to live in these times? How does it feel? How does the climate crisis affect your relationships? How does it affect your identity?? How does it affect how you plan your future and make major decisions? I will discuss these topics, share from the guide, and ask callers to share their thoughts and experiences. Mobilizer Backers are the foundation of the Climate Mobilization. They provide us with reliable income and support the spreading of climate truth and the building power for emergency climate mobilization all over the country. Because we leverage a huge amount of volunteer capacity, your gift will have a much greater impact. Please become a Mobilizer Backer today. I hope to see you on the calls soon! Allies! I am very pleased to share my new paper with you. With unique skills as a psychologist, social anthropologist and community organizer, Margaret Klein Salamon has ripped the cover of denial and inaction — no more incremental steps. We are in an emergency — the climate crisis has us headed towards catastrophe and we must now recognize that emergency mode is our only hope. But why haven’t we been? Read this and know the WWII mobilization that is growing exponentially and is required to pull us back from the brink. Thank you Margaret for this brilliantly conceived, urgent call to arms. It’s no wonder so many people are depressed about the climate. Now that extreme weather events are rushing in on us with ever greater intensity and frequency, we realise at last that the issue is real. But, we also “know” that we have left things too late because society always takes forever to put solutions in place and everything that is done always involves unsatisfactory compromises and half-measures. In her new paper, Margaret Klein Salamon tells us we must go into climate emergency mode engaging our whole beings. Salamon parallels our situation with the 1980s when activists successfully mobilized AIDS response around the slogan, “Silence is death.” Today we must say that promoting gradual solutions to a climate crisis gone critical is a form of silence that will lead to global catastrophe. For the world to take the climate emergency seriously, we in the climate movement ourselves have to do that. We must loudly speak the truth of the critical climate emergency we are facing and the World War II-scale mobilization needed to address it. —Patrick Mazza, Delta 5 activist, founder and former director of Climate Solutions, author of Cascadia Planet. Imagine there is a fire in your house. What do you do? What do you think about? Your senses are heightened, you are focused like a laser, and you put your entire self into your actions. You enter emergency mode. The climate crisis is an unprecedented emergency. It is, far and away, the United States’ top national security threat, public health threat, and moral emergency. Humanity is careening towards the deaths of billions of people, millions of species, and the collapse of organized civilization. States under severe climate stress, such as Syria, are already starting to fail, bringing chaos, violence, and misery to the region and political instability to Europe. America’s political system is also starting to convulse as the two-party system is showing signs of fragility. How we react to the climate crisis will shape centuries and millennia to come. Given the stakes, and the extremely short timetable, it is imperative that we strive to maximize the efficacy of our actions — from ourselves as individuals, from our nation, from the global community of nations, and from the organizations that are trying to avert this catastrophe. This has huge implications for the climate movement’s communication style, advocacy, and strategy. Because emergency mode is contagious, the best strategy is for climate activists and organizations to go into emergency mode themselves, and communicate about the climate emergency, the need for emergency mobilization, and the fact that they are in emergency mode, as clearly and emphatically as possible. I founded and now direct a national grassroots organization called The Climate Mobilization (TCM) that is based on an understanding of emergency mode, as well as the transformative power of climate truth. We launched in late 2014 and began spreading the Pledge to Mobilize and advocating for WWII-scale climate mobilization at the People’s Climate March in New York City. We are still small and poorly funded, but we are growing all the time, and our supporters are immensely dedicated — they have entered emergency mode! They are busy starting and running TCM chapters across the country and planning for our upcoming National Day of Action for Climate Mobilization on July 10th. We have also been very successful in recruiting elected leaders and candidates for elected office to take the Pledge to Mobilize. In the last week alone 4 new candidates for US Congress have committed to championing a WWII-scale climate mobilization, including Tim Canova, who is running against Debbie Wasserman-Schultz in one of the most closely watched congressional races in the country. This paper is based on a combination of theory and practice — I have researched social movements, flow states, and more, to develop the concept of emergency mode — and these ideas have been developed and refined through my experience in running TCM and attempting to communicate about the climate crisis to people from all walks of life. I will make specific suggestions for the climate movement in the second half of this paper. But first, we must understand emergency mode. Most psychological and sociological writing about the climate crisis has warned climate “communicators” of the risks of triggering primitive and pathological responses to crisis: “fight or flight”, panic, and the devastation caused by Post Traumatic Stress Disorder. Because of these bleak portrayals, many political and organizational leaders have dared not convey the horrifying truth of the climate crisis, since they operate under the mistaken belief that the only response to emergencies is panicked chaos! But aside from panic, individuals and groups can also respond to emergencies with reason, focus, dedication, and shocking success. Emergency mode is the mode of human psychological functioning that occurs when individuals or groups respond optimally to existential or moral emergencies. This mode of human functioning, markedly different from “normal” functioning— is characterized by an extreme focus of attention and resources on working productively to solve the emergency. We are all, at times, confronted with emergency situations. Children, and adults who are overwhelmed by the situation for whatever reason, enter either panic mode, in which they act without thinking, or are paralyzed and unable to act. Children, for example, will often hide during house fires. However, healthy adults respond to emergencies by entering emergency mode. 3) Giving little priority to personal gratification and self-esteem enhancement for their own sake, and instead seeking them through engagement with the emergency. People seek to “do their part” to solve the crisis and build their skills to contribute more effectively. Usually emergencies take hours or days to resolve, but people can and do also enter long emergency modes that last for years. These “long emergencies” include diseases like cancer, which is life-threatening but not immediately curable, acute poverty, in which the person struggles daily with the emergency of meeting basic needs, and war. For these long emergencies, the business of normal life must be integrated into the emergency response. For doctors, nurses, paramedics, crisis counselors, hostage negotiators, firefighters, police officers, soldiers, and (hopefully) climate campaigners, emergency mode is a regular, on-going experience. There is also moral emergency mode, when an issue—usually regarding freedom or equality—becomes elevated to the status of an existential threat. People in moral emergency mode are the driving force behind most, if not all, successful social movements. These people have decided that nothing, not even survival, is more important than the struggle. They dedicate themselves to it fully and utilize all of their capabilities in the service of victory. In short emergencies such as a fire, individuals stay in an emergency flow state the entire time. If the individual is in long emergency mode, however, these emergency flow states are experienced frequently, but other elements of life, such as rest, recreation, and close relationships, are also maintained. Indeed, balancing one’s intensive work on solving the emergency and all other activities is one of the most challenging elements of facing a long emergency. I have spoken with Emergency Room doctors, firefighters, and climate campaigners who report being hooked on the sense of purpose, feeling that they are useful, and the relief from self-involvement that their immersive work provides. People must feel basically competent to handle the emergency in order to enter emergency mode. If people don’t know what to do during an emergency, they may panic, despair, or resist going into emergency mode at all. This is why having structures such as a designated phone number to call in case of any emergency (9-1-1), or a designated place to go (the Emergency Room) during medical crises are so helpful—they provide clear steps for people confronting emergencies, making it much easier for people to enter emergency mode. The more the climate movement can provide structures for people’s engagement — clear directions and support for people who are ready to tackle the climate emergency — the more people will go into emergency mode. Effective, transparent leadership is also critical in enabling people to enter emergency mode. Confidence that leaders and decision makers are competently addressing questions of strategy and policy for the emergency mobilization allow participants to focus on their contribution. In emergency mode, members of groups — such as organizations, or even whole countries — work productively together in a coordinated way to solve a crisis. The vast majority of people contribute their best effort and available resources. People fill different roles and take on complementary projects in order to ameliorate the crisis. While the profit motive and self-interested behavior are not eliminated in a long emergency, working for the common good to create solutions, rather than focusing on their own comfort or advantage, becomes the norm. People gain satisfaction and pride from helping the group or the wider emergency project, and they feel motivated, even driven to do so. Humans evolved in tribes, and group success was vital to the survival of each individual. Psychologist Jonathan Haidt describes human nature as “90% chimpanzee and 10% bee” to illustrate our evolved, combination of social but self-interested (chimpanzees) and group-oriented behavior (bees). We are like bees in being ultra social creatures whose minds were shaped by the relentless competition of groups with other groups. We are descended from earlier humans whose groupish minds helped them cohere, cooperate, and outcompete other groups. That doesn’t mean that our ancestors were mindless or unconditional team players; it means they were selective. Under the right conditions, they were able to enter a mind-set of “one for all, all for one” in which they were truly working for the good of the group, and not just for their own advancement within the group. By far the most powerful trigger for the “hive switch” is a catastrophic event that clearly signals the arrival of an emergency, particularly an external attack. The surprise attack on Pearl Harbor led the United States to “flip the hive switch” and enter emergency mode in an incredibly powerful, productive way. After years of stubborn, isolationist denial of the threat and clinging to “Normal Functioning” as Germany swept through Europe, the surprise attack on Pearl Harbor ended American isolationism and initiated the example par excellence of America in emergency mode: full-scale mobilization. Economic mobilization is an emergency restructuring of a modern industrial economy, accomplished at rapid speed. It involves the vast majority of citizens, the utilization of a very high proportion of available resources, and impacts all areas of society. It is nothing less than a government-coordinated social and industrial revolution. Mobilization is what happens when an entire nation enters emergency mode, and the results can be truly staggering. Crises are constrained within business-as-usual mode. Society engages productively with crises, but not in panic mode. Spin, denial, and ‘politics as usual’ are employed. The situation is assessed with brutal honesty. No urgent threat is perceived. Immediate, or looming, threat to life, health, property, or environment is perceived. Problem is not yet serious. High probability of escalation beyond control if immediate action is not taken. Time of response is not important. Speed of response is crucial. The crisis is one of many issues. The crisis is of the highest priority. A labor market is in place. Emergency project teams are developed, and labor planning is instituted. Budgetary ‘restraint’ is shown. All available /necessary resources are devoted to the emergency and, if necessary, governments borrow heavily. Community and markets function as usual. Non-essential functions and consumption may be curtailed or rationed. A slow rate of change occurs because of systemic inertia. Rapid transition and scaling up occurs. Market needs dominate response choices and thinking. Planning, fostering innovation and research take place. Targets and goals are determined by political tradeoffs. Critical targets and goals are not compromised. There is a culture of compromise. Failure is not an option. There is a lack of national leadership, and politics is adversarial and incremental. Bipartisanship and effective leadership are the norm. During WWII, conservative business titans joined labor leaders and liberal bureaucrats — after years of bitter acrimony over the New Deal — to focus America’s industrial might against the Nazis and Imperial Japan. Factories were rapidly converted from producing consumer goods to producing tanks, guns, bombs, and planes — shattering all historical records for war production. All hands were on deck. Young men sacrificed their lives fighting for their country. Women surged into factories to produce war materiel. Scientists and universities pumped out research on behalf of the war effort leading to huge technological and intellectual breakthroughs. More than 10% of the population relocated, often across state lines, in order to find a “war job,” and more than 40% of vegetables were grown at home, in Victory Gardens. During this multi-year emergency, the United States also managed to maintain — and in some cases expand — its basic systems including infrastructure, education, health care, and child-care, and in large measure made sure that the basic needs of the civilian economy were met. Soldiers and civilians alike needed to balance hard work with rest and relationships. However, the entire country was suffused with a sense of national purpose, and a great amount of energy. Citizens invested their available cash reserves in war bonds. Taxes were also increased significantly, particularly on high earners, who paid a steep “Victory Tax,” the most progressive tax in American history. The top marginal income tax rate on the highest earners reached 88% in 1942 and a record 94% in 1944. A tax on excess corporate profits provided about 25% of revenues during the war. The federal government instituted a sweeping rationing program in order to ensure a fair distribution of scarce resources on the home front – and to share the sacrifice equitably. Gasoline, coffee, butter, tires, fuel oil, shoes, meat, cheese, and sugar were rationed, and every American received a fair share. “Pleasure driving” was banned, the Indy 500 was shut down, and a national speed limit of 35 miles per hour was established. Comprehensive wage and price controls were put in place to combat inflation. By entering emergency mode and mobilizing for total victory, the United States accomplished truly staggering feats. After the attacks on Pearl Harbor, when the United States finally entered WWII, President Franklin Roosevelt laid out terrifically ambitious production targets for tanks, ships, guns, and airplanes. FDR set a goal of producing 60,000 planes in two years. People were deeply skeptical about whether such a feat could be accomplished. And yet, by 1944 the United States had produced 229,600 planes — more than three times the original, highly ambitious, goal! In response to a cutoff of critical rubber supplies in Southeast Asia, the federal government launched a crash program that scaled up synthetic rubber production from under 1% to about 70% of total U.S. production — a 100-fold increase — in about four years. In 1943, reclaimed rubber from citizen scrap drives provided about 50% of domestic rubber production. We also made huge advances in the sciences. The first computer was invented, as were blood transfusion and radar technology. The Manhattan Project successfully built the world’s first atomic bomb in less than three years — a morally catastrophic but nonetheless stupendous feat of planning, cooperation and scientific ingenuity. Why Hasn’t The Climate Crisis Triggered Emergency Mode? Emergency mobilization on this scale is precisely what we need if we are to prevent a global cataclysm and restore a safe and stable climate. We need to transition away from fossil fuels and carbon-intensive agriculture as soon as possible, draw down all the excess CO2 and cool the planet below present levels. This will happen only with public planning coordinated by the federal government, global cooperation, massive public investment, forceful regulations and economic controls, and full societal participation. There is a hidden consensus among experts and leaders in the climate movement that these transformative changes can only be accomplished in time with a massive, WWII-scale mobilization. This metaphor has been used by figures as wide ranging as Bernie Sanders (video), climate scientist Michael Mann, AFL-CIO President Richard Trumka, Sierra Club Executive Director Michael Brune, Ted Turner, New York Times Columnist Thomas Friedman, and Bill McKibben, the Founder of 350.org. All of these thought leaders agree that we should enter emergency mode and mobilize — but they don’t seem to have a strategy about how to make this happen; they are not actively campaigning for a WWII-scale climate mobilization. Perhaps they don’t understand how emergency mode works, or they don’t believe that they could actually lead such a shift. Or maybe they think it can never happen. Stuck in carbon gradualism. Most of these thought leaders, like most climate organizations, and most Americans, are still stuck in the stultifying morass of gradualism and business as usual. Politicians argue over whether to cut emissions insufficiently (the position generally held by Democrats), or not at all (the position generally held by Republicans). The crisis is hardly mentioned by the presidential candidates or the media. The established environmental movement advocates for very gradual actions like the Clean Power Plan that will lead to continued fossil fuel use for decades or a revenue-neutral carbon tax that Republicans will be, theoretically, unable to oppose. Even groups like Greenpeace and 350 call for a multi-decade, gradual transition away from fossil fuels. Furthermore, virtually no mainstream environmental groups call for actions to draw down (or sequester) excess greenhouse gases, which must begin now on a massive scale and are essential if we are to avoid a climate catastrophe and restore a safe climate. Many groups act as though a net zero emissions-only strategy can protect us and that there is a sizable “carbon budget” left. However, CO2 concentrations are high enough right now (~405 ppm) to cause at least 2°C warming above pre-industrial levels, according to Michael Mann. Anyone who has followed the climate science in recent years should know that 2°C of warming would cause a world-historical catastrophe. Furthermore a net zero emissions-only strategy will actually cause a substantial burst of further warming in the short-term, as the cooling effect of aerosol emissions from coal-fired power plants is eliminated. James Hansen calls this humanity’s “Faustian Bargain.” If “all” we do is switch to 100% renewables, the public will surely become very confused and angry with us when the planet starts warming up even faster! The psychological capacity for both normal mode and emergency mode arose over hundreds of thousands of years of human evolutions. Individuals and groups who usually manage broad and diverse interests, but are able to snap into intense focus when in danger, have the best overall survival prospects. The challenge is when to enter emergency mode, when to continue business as usual, and how to trigger a switch in mode. The factors that trigger an emergency response are also products of evolution. Psychologist Daniel Gilbert argues that humans are wired for a reflexive response to threats that are “intentional, immoral, imminent, and instantaneous.” When threats, such as terrorism, contain all of these characteristics it can trigger significant over-reactions. But if a threat, such as the climate crisis, does not contain these elements and is instead unintended, caused by actions that are regarded as normal and moral, with the worst impacts in the future and the disaster unfolding over decades, then an emergency response will not immediately be triggered and the risk of under-reacting is very high. We cannot count on people entering emergency mode reflexively. Instead, we will need to use our intellects and power of communication. We must educate people. We humans can use our intellect to understand what is happening and choose to treat the climate crisis as an emergency. Helplessness. A sense of helplessness is preventing many people from entering emergency mode in response to the climate crisis. Our political system seems intractable, the culture in the thrall of denial, and the scale of the crisis is staggering. Widespread feelings of helplessness also represent the failure of leadership from official climate movement leaders and politicians to offer an honest assessment of the crisis, advocate for solutions that actually stand a chance of working, and invite individuals to take part in that solution. The Bernie Sanders campaign is a contemporary example of how hope of transformative success, including a credible leader who promises to implement change, can turn mass dissatisfaction, anger, and despair, into mass engagement. To go into emergency mode on climate change, people need to believe that restoring a safe and stable climate is possible — that the political will can be achieved by the climate movement, and that the rapid transition can be coordinated by competent leadership. A quarter of respondents think that humanity has a 50% chance of near–term-extinction, and almost all respondents agreed that transformative change is necessary — yet we are continuing with business as usual and daily life as usual! This suggests a paralyzing degree of helplessness across society. It also suggests that if the climate movement can offer the public a credible social movement and economic mobilization framework and evidence of credible leadership to prevent the rapidly approaching climate catastrophe, then we can expect passionate and dedicated support. 1) Going into emergency mode yourself. 2) Communicating that as clearly as possible. 3) Creating a plausible path towards solving the crisis, to which people can contribute. The way we respond to threats — by entering emergency mode or by remaining in normal mode — is highly contagious. Imagine the fire alarm goes off in an office building. How seriously should you take it? How do you know if it is a drill or a real fire? Those questions will be predominantly answered by the actions and communications of the people around you, particularly people designated as leaders. If they are chatting and taking their time exiting the building, you will assume that this is a drill. If people are moving with haste, faces stern and focused, communicating with urgency and gravity, you will assume there is real danger and exit as quickly as possible. This is a critical point, with grave implications for the climate movement. To evaluate whether we are currently in a climate crisis, the public will look to each other — and particularly to the climate organizations, writers, and leaders. Are they calling it an emergency? Does the tone of their writing and statements convey alarm and a passionate desire for massive action to avert imminent crisis? Are they demanding an emergency response? Are they acting like it’s an emergency? Are they themselves in emergency mode? If the answer to these questions is “no,” the individual will conclude that there must not be an emergency, or that emergency action is hopeless because the leaders are apparently unwilling to coordinate emergency action. This suggests the sad, dangerous conclusion that NGOs who advocate carbon gradualism are actually preventing the public from entering emergency mode. Let us consider how successful social movements have gone into emergency mode themselves in order to achieve tremendous change. I will then offer specific suggestions for the climate movement. ACT UP. In the 1980s, HIV, the virus that causes AIDS, was decimating the gay communities in New York, San Francisco and other large cities, and it was spreading at a horrifying speed. The government was failing the victims — giving them virtually no help, and failing to research and treat this growing epidemic. The government’s failure to act swiftly and effectively, or even acknowledge the epidemic, was largely due to pervasive homophobia. Emergency Language. Kramer knew that he was fighting for his own life and the life of his friends. He had no interest in “business as usual.” He wanted the government to act on AIDS now — to start researching the illness, finding treatments, treating the sick, and preventing transmission. Kramer treated AIDS with deadly seriousness and encouraged as much (realistic) fear as possible. He told crowds of gay men that if they didn’t fight back, they would be dead in a few years. Kramer referred to AIDS repeatedly as a “Plague” and the politicians who ignored it as “Nazis” and “Murderers.” ACT UP’s symbol was a pink triangle—symbolizing the genocide of gay men during the Holocaust. He was inviting others, especially other gay men, to join him in emergency mode, focused intensely on solving the crisis. ACT UP’s slogan, “Silence=Death” referred not only to governmental and media silence on AIDS, but the entire cultural silence around homosexuality. Many gay people were closeted, hoping to protect their careers and avoid discriminatory, dehumanizing reactions from a homophobic culture. “Why isn’t every gay man in this city so scared shitless that he is screaming for action? Does every gay man in New York want to die?… I am sick of closeted gay doctors who won’t come out to help us…. I am sick of closeted gays. It’s 1983 already, guys, when are you going to come out? By 1984 you could be dead. The push to come out and live out of the shadows without shame was prominent and incredibly powerful throughout the AIDS movement. How many people came out in response to the AIDS crisis? How many individual conversations were had in families, among friends, among colleagues? Perhaps millions. It had a profound impact as the public learned that people they loved and respected were gay, and in danger. Education and Advocacy. Because the government was failing to provide answers and effective treatment, ACT UP took on significant educational work as well. The Treatment + Data Committee took on the task of becoming experts in the biology of HIV/AIDS— seeking to understand the virus and various treatment options. A glossary of AIDS treatment terms was created and passed out at meetings. ACT UP also produced and advocated A National AIDS Treatment Research Agenda , which laid out ACT UP’s specific demands for what drugs should be developed and how the process should unfold. Members of ACT UP successfully shut down trading on the floor of the New York Stock Exchange. They chained themselves inside pharmaceutical corporations and blockaded offices at the FDA, plastering posters with bloody handprints to the outside of the agency’s headquarters. They stopped traffic on the Golden Gate Bridge and interrupted mass at Saint Patrick’s Cathedral. Using fake IDs to enter CBS headquarters, they jumped onscreen during Dan Rather’s nightly news broadcast, reeling off a string of chants before the network cut to a long, unplanned commercial break. ACT UP draped a giant yellow condom over the Washington home of Senator Jesse Helms, one of the movement’s most ardent and homophobic adversaries. And during a 1992 memorial in Washington, the group’s members held a procession to scatter the ashes of friends and lovers who had died of AIDS onto the White House lawn. Public health administrators disliked by ACT UP members were sometimes hung in effigy at protests. These events demonstrated the fact that the members of ACT UP were in emergency mode — that they recognized an existential threat, and that addressing that threat was their top priority, channeling their energy, focus, and resources towards resolving the emergency and restoring safety. By demonstrating their courage and tenacity, ACT UP grew in size and power, drawing more people into emergency mode. New members contributed their skills, resources, and networks to the cause. By keeping their protests non-violent, ACT UP invited participation from a larger group. Erica Chenoweth has demonstrated that non-violent campaigns are much more likely to be successful at involving significant portions of the population, and more successful at accomplishing their overall goals. (Partial) Success! With its combination of public protest, private acts of courage, and education & advocacy, ACT UP accomplished many of its aims. AIDS patients won the right to participate in every phase of the drug development process. They won major funding for research, which led to the discovery and deployment of antiretrovirals, a class of drugs that is very successful in treating HIV, potentially keeping the disease from ever becoming AIDS. ACT UP’s success laid the groundwork for mainstream acceptance of homosexuality, as well as the continuing struggles for gay rights and equality. It also forever changed the way pharmaceutical drugs are researched and developed. ACT UP’s work has not been completed, however. AIDS has become a global epidemic, with more than 36 million people currently infected, and 1 million people dying from AIDS every year. There is still no cure and no vaccine, something that Larry Kramer and many others continue to work on. It took contributions from researchers, doctors, nurses, policymakers, public health officials, journalists, government officials, and more — who worked tirelessly for more than 30 years — to create conditions where more than 16 million people are receiving highly-effective HIV treatment in all parts of the world (though 20 million are not treated). Activists could never accomplish such a feat alone. But what ACT UP did accomplish was to get people and institutions, especially the Federal Government, and also local governments, hospitals, universities and more — to treat HIV/AIDS like the crisis it was. Like ACT UP, the climate movement is responding to a direct existential threat. 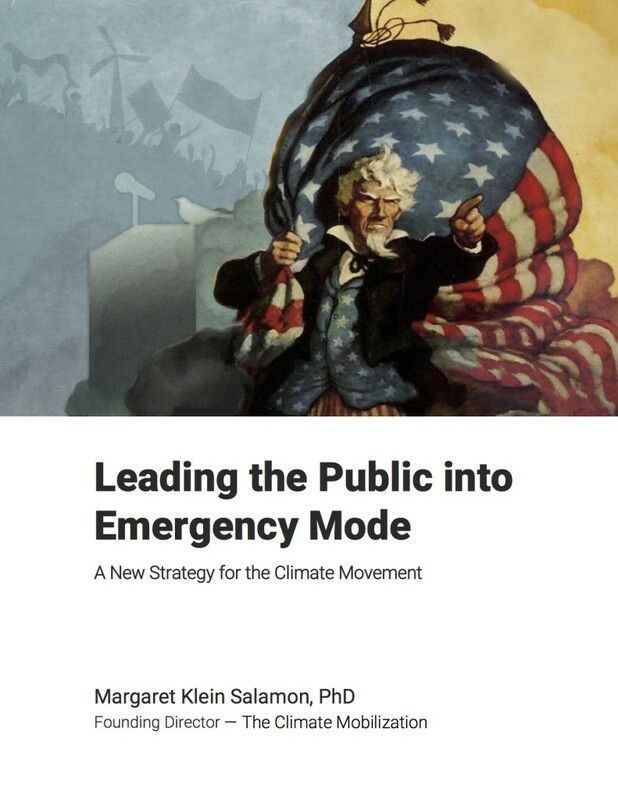 Understanding that emergency mode allows individuals and groups to function in an enhanced, optimal way, delivering their peak performance, has critical implications for the climate movement. We must exit normal mode and abandon the gradual policy advocacies and enervated emotional states that accompany it. Instead, we must seek to restore a safe climate at emergency speed. To accomplish this, the climate movement must lead the public into emergency mode. First we must go into emergency mode ourselves, and then communicate about the climate emergency and need for mobilization with clarity, dedication, and escalating assertiveness. Those of us who have entered emergency mode — who understand the mobilization imperative — need to get talkative and loud. We need to spread our message as far and wide as possible. We must not stay “closeted” and appear that we believe everything is fine, or that the Obama Administration or the Democratic Party are well on their way to containing the crisis, once the Republicans and the Supreme Court get out of the way. Rather we need to “come out” as being in emergency mode and in favor of a WWII-scale climate mobilization that rapidly sweeps away business-as-usual — to our friends, family, neighbors, fellow climate activists, and the public. Like ACT UP we need to spread our message as clearly, loudly and in the most attention–grabbing ways we can. Seeking Consensus. While we must seek to learn as much as we can from ACT UP and other successful social movements, we must also recognize that the climate crisis poses a challenge unlike anything humanity has ever faced. Full-scale emergency mobilization requires a higher degree of participation and consensus than treating AIDS, implementing civil rights legislation, or even toppling a dictator. ACT UP didn’t bring the entire public into emergency mode, but because they entered emergency mode themselves they were able to apply pressure very strategically. ACT UP could be something of a gadfly — alienating many and still achieving their agenda. They were an oppressed minority that needed to move huge bureaucracies, and they did. The climate movement faces a larger task. We must effect change throughout our entire society. We want to “wake America up” to the scale of the threat, and the need for mobilization, as America woke up to the need for WWII immediately following the attacks on Pearl Harbor. Thus we must seek to be as inclusive as possible, while unwaveringly demanding WWII-scale climate mobilization. Our tone must balance emergency-mode, steadfastness, assertiveness, and inclusiveness. Pope Francis calls for people to have an “ecological conversion,” and we must adopt the attitude of understanding and forgiveness for individuals past denial or climate-damaging activity. 1) Social movements can cause immense, rapid change. 2) During WWII, America mobilized and achieved a transition more rapid and complete than anyone thought possible. 3) We as citizens have the power to change the direction of this country, and if we successfully build political will for full-scale climate mobilization, the results will be staggering. The Transformative Power of Climate Truth. While the climate movement has many imposing forces aligned against it, we also have a uniquely powerful strategic asset — the truth. The truth is that no human endeavor can succeed on a planet beset by catastrophic climate change. None of our values, joys, or relationships can prosper on an overheated planet. There will be no “winners” in a business-as-usual scenario: Even wealthy elites are reliant on stable ecosystems, agriculture, and a functioning global civilization. For that reason, among others, solving the climate crisis has the potential to be the most unifying endeavor in human history. How can we most effectively communicate the climate emergency to the public? I propose the following strategies, based on my theoretical understanding of emergency mode and the transformative power of climate truth, as well as my experience building The Climate Mobilization. It is important that we keep emergency communication crystal clear otherwise people will — rightfully — suspect that we are not giving them the full story. Then, I will offer specific communication strategies including: person-to-person conversations, community education, advertising, and protest. Emergency Threat. In order to lead people into emergency mode, it is critical that the emergency threat is paired with an emergency solution (whenever it is available). First and easiest, the climate movement must fully adopt the language of immediate crisis and existential danger. We must talk about climate change as threatening to cause the collapse of civilization, killing billions of people, and millions of species. These horrific outcomes await us during this century, possibly even in the first half of it if things truly slip out of control. This is not a matter of “protecting the planet for future generations” but protecting our own lives and those of the people we care about. We are in danger now and in coming years and decades. The climate crisis is, far and away, our top national security threat, top public health threat, and top threat to the global economy. Emergency Solution. Climate groups must match this emergency rhetoric with an emergency advocacy. Suppose that someone told you, “Help! My house is on fire! Can you please pour a glass of water on it? One glass is all it needs!” You would be confused. If we are really dealing with a house on fire, how could a solution be so simple and easy? You would suspect that there was no crisis, just exaggeration. Likewise, when the scale of the necessary response to the climate crisis is minimized, it prevents people from entering emergency mode. We need to “come out” as in emergency mode — climate “alarmists,” as horrified by the crisis, and as ready to make major changes in our life and the economy, for the duration of the emergency. We cannot be silent about the fact that emergency mobilization can only be coordinated by a “big” government that is granted the power to spend without limit to save as much life as possible. We must acknowledge that gradual approaches that prioritize political expediency and the alleged wisdom of the “free market” over the common good are doomed to failure. We need to eliminate net greenhouse gas emissions in years, not decades, and remove excess greenhouse gases from the atmosphere until a safe climate is restored. This will take a whole-society, all-out effort. It will also require significant changes in the American lifestyle. Even if we undertake rapid, all-hands-on-deck mobilization that drives the economy to zero emissions and removes massive amounts of greenhouse gases from the atmosphere, action may need to be taken to quickly cool the planet. Solar radiation management interventions — approaches meant to reflect a small amount of sunlight away from the earth and quickly cool the planet — carry very significant risk, and must be researched extensively in a transparent, public program before deployment is considered. However, the danger of the climate crisis is so tremendously great that it might turn out to be beneficial to temporarily deploy solar radiation management technology in conjunction with an emergency-speed elimination of emissions and a huge carbon drawdown effort if we are to prevent a catastrophic, irreversible “continuous thaw” of the Arctic permafrost and other extreme climate changes. If solar radiation management technologies are deployed to temporarily limit warming or cool the planet, they must be democratically governed in cooperation with the world community, and massive financial resources must be devoted to comprehensively protect vulnerable communities from any adverse effects. 2°C or 1.5°C of warming above pre-industrial levels represent “safe limits” to global warming. “Our grandchildren” may be in a “climate emergency” sometime in the future if we don’t change. We still have a sizable global “carbon budget” left to safely burn before things get really out of control. Extremely gradual emission reduction strategies — such as the Clean Power Plan — are huge steps forward. Climate justice and other social justice objectives are compatible with carbon gradualism. It’s not worth solving the climate crisis and saving billions of lives unless we simultaneously create a utopian society. Ending emissions will be “cheap,” “easy” or “painless” and can be accomplished smoothly but slowly via market-based policy instruments alone (such as an emissions trading system or a carbon tax). If we only reduce the fossil fuel industry’s stranglehold on politicians, the problem will solve itself. The climate crisis is only a dirty energy or electricity issue that can be solved without massive ecosystem restoration, the transformation of industrial and animal agriculture, and a revolution in land use and soil management. A zero emissions-only strategy (without drawdown and possible cooling) is all that is needed to protect us from climate catastrophe. Carbon drawdown approaches and solar radiation management should not be discussed as legitimate options or studied since they will only distract from emissions reduction and societal transformation. The broader overshoot, sustainability, and mass extinction emergencies relating to exponential global population and consumption growth are not worth mentioning or factoring into our policies as we respond to the climate crisis since they are overwhelming, not widely accepted by the public, and seem far away. Overcome Affect Phobia. Communicating with this level of honesty will require an emotional shift in the climate movement. Climate organizations are going to have to get more comfortable expressing and inviting uncomfortable emotions. The climate movement has generally emphasized facts and avoided feelings. This is probably in part because scientists report the unfolding climate crisis to us in their objective, often emotionally detached style. Also, because the emotions that the climate crisis inspires are so intense, the climate movement, it seems, has tried to avoid them as much as possible. Affect phobia is often official. For example, Columbia University’s popular CRED Guide to Climate Communications contains a section, “Beware the Overuse of Emotional Appeals,” in which they caution presenters to avoid telling the whole truth about the climate crisis, as this would cause “emotional numbing.” So presenters are given strategies including choosing a specific “portfolio of risk” to communicate — such as the link between climate and disease — rather than the whole, frightening truth. While it is accurate that climate truth overwhelms some people, the climate movement should be focused on turning people on — getting more people to enter emergency mode as activists. Further, some people will be “turned off” by climate truth temporarily, but will process it over time and then enter emergency mode later. With the truth, we give people the opportunity to face the facts and their feelings, and move forward productively. Without the truth, we deny them this chance. Another critical reason for organizations and leaders to overcome affect phobia is to provide a safe space to discuss the crisis in the fellowship of others who understand. People who understand the climate crisis are often alienated, feeling that they must act “as if” things are OK in order to get along. Climate advocacy organizations should create a place where people can process the reality and implications of the climate crisis together. This kind of supportive, generative atmosphere can only occur when the truth is embraced, and we are able to tolerate the emotions that the truth inspires. If the organizational culture is to stay perpetually cheerful and stay away from the horrifying truth of our situation, people will not feel free to express their true feelings. A frequent reaction that new people have to joining The Climate Mobilization conference calls is, “It’s such a relief to hear people speaking truthfully, and meet so many people who understand what’s really going on.” Sometimes, people cry on our calls, and we treat it as a normal reaction to an incredibly difficult situation. If you feel the urge to say, “But people can’t handle the truth,” question whether you may be reacting to your own anxiety and your own difficulty processing the climate crisis. Of course it’s difficult! Of course people will feel afraid, angry, and grief-stricken. Those are rational, healthy reactions to the surreal and nightmarish reality we find ourselves in. The climate movement should leverage the inherent power of climate truth, and the deep human desire to avert a catastrophic future. The climate movement should be shouting the truth of the climate emergency from the rooftops — constantly searching for the most effective ways to amplify this message. The list below is not meant to be a comprehensive list. The climate movement should be continually testing new methods of communicating the climate emergency, and scaling up the most effective ones. The book “Beautiful Trouble” outlines techniques that activists have used for a variety of projects around the world and is very helpful for brainstorming, as is Gene Sharp’s list of 198 Methods of Non-violent Action, and appendix of Dictatorship to Democracy. The most basic, and highly effective, mode of climate activism is talking to people you know about the crisis and need for mobilization. In the same way that ACT UP called on gay men to come out of the closet so that they could build collective power, we should “Come out” as being firmly in emergency mode! We need to talk about the fact that we are deeply alarmed and terrified of the climate crisis, but that a solution is possible! We must tweak ACT UP’s slogan and make it clear that Climate Silence=Death! If we are silent, our understanding does not become power. 2015 Polling from Yale’s Climate Communication Center found that only 4% of Americans hear people they know talk about climate change at least once a week, and only 12% once a month! And yet the same study shows that 11% of Americans are “very worried” about climate change! It’s time for this group to get talkative and loud. We must overcome our anxiety about having hard conversations and embrace the fierce urgency of now. Every week we delay mobilization is a month for tipping points to be hit, species to go extinct, and states to fail. Lots of people are already dying on our watch. 1,000 children are dying every day from climate change-linked starvation & disease. Emergency Education and Outreach. Further, activists who have become expert in the climate crisis and the need for mobilization should give presentations to congregations, professional associations, unions, colleges, and community groups. Public presentations should be offered regularly in cities across the country on the climate crisis and need for immediate, emergency mobilization. These presentations should be advertised, not as a way to “get informed”, but rather as an appeal to the public’s sense of threat and danger, “How can I protect my family from the climate crisis?” Or “The Climate Crisis: How much danger are we in and how can we reverse it?” These presentations should explicitly invite the participants to take part in the movement to implement an emergency climate mobilization. One of the primary tasks for all interested in getting involved will be spreading climate truth and effective strategies to others. Advertising and Guerrilla Advertising. Climate groups with financial resources should purchase advertising space in print and TV warning the public about the near-term threat of a collapse of civilization, and the need for WWII-scale climate mobilization. (See above section on “overcoming affect phobia”) Climate groups that cannot afford to purchase ad space should engage in a guerrilla marketing campaign in which the climate emergency (and the need for climate mobilization) is communicated through things such as hanging banners from prominent buildings, opening public advertising displays and replacing them with climate emergency posters, stickers, graffiti, and more. Further, the climate movement should train rapid response teams across the country to educate and demonstrate after super-storms and other global warming-supercharged “natural” disasters hit. These are important moments — moments where the coming horrors of the climate crisis are made manifest. The media often focuses intensely on disaster zones, and live demonstrations, with banners calling for WWII-scale climate mobilization displayed at disaster sites, have the potential for tremendous symbolic value. Lobbying and Pressure Campaigns. The climate movement should launch an intense pressure campaign targeting elected leaders, media outlets, universities and thought leaders. The campaign should call on leaders to courageously face reality, enter emergency mode, and protect civilization. These pressure campaigns should escalate in degrees of assertiveness, all the way to disruptive protest. However, even in a protest, we must maintain an open, welcoming attitude. Thus, while we will need to be quite confrontational and unwavering, we are not “against” our targets of protest. We gain nothing from demonizing them. We need these leaders to do the right thing. The tone should not be primarily angry, but urgent and insistent. Burning figures in effigy, for example, would probably not be helpful. Rather, the tone should be serious and patriotic. We are calling on America to lead the world in heroic, world-saving action! Protests should involve elements of protestor sacrifice, such as risking arrest or hunger strike, to generate empathy from the public. Maintaining strict non-violence is critical to winning widespread public support and is non-negotiable. 3) Use their considerable powers and resources to protect civilization from collapse. Elected leaders and candidates. James Hansen first testified before Congress in 1988 about the dangers of climate change, and for the next 28 years, denial, woefully insufficient gradualism, and paralysis have dominated Washington’s response to the climate crisis. Our elected leaders are failing to protect us. It’s up to us to bring them out of complacency and denial and into emergency mode. These efforts should start with outreach and lobbying, ideally from constituents who tend to be ideologically aligned with the legislator in question, and escalate into pressure campaign and then to protest. Climate advocates should seek to discuss the climate crisis and need for mobilization with their elected representatives and their staff. Constituents should ask their leaders to take a heroic stand and champion a WWII-scale climate mobilization. The Pledge to Mobilize is a tool that facilitates these interactions. The Pledge provides structure—a concrete set of demands and a clear way that the Congressperson can endorse them—by signing. TCM provides outreach materials, and education materials, so the constituent can be ready to defend the demands of the Pledge. This strategy has proven successful thus far—a growing number of elected leaders and candidates for office have signed the Pledge to Mobilize. In the event that asking and educating are not sufficient, campaigners should escalate the pressure behind their request. Demonstrating outside of or even occupying congressional offices as well as state houses and city halls, with, sit-ins, die-ins, hunger strikes, mobilization parties, political theater and humorous action, and other disruptive action can be utilized to draw the public’s attention and put increasing pressure on politicians to mobilize. All elected leaders and candidates, regardless of party, should be targeted, with a focus on Congress. Both Republican climate deniers and Democrat climate gradualists should be challenged to enter emergency mode and informed that we will be interrupting their “normal mode” until they decide to champion emergency climate action. The media — especially television news — is another critical target for educational outreach followed by pressure campaign and escalating disruptive protests. A Media Matters study found that, ABC spent a total of 13 minutes in 2015 covering climate change. That’s 13 minutes — total — across all ABC news shows, for a year. NBC spent 50 minutes and CBS 45 minutes. Fox News spent 39 minutes, and most of it was skeptical of climate science. This is beyond pathetic — it is a crime against humanity. A shocking, dismal failure of television news to serve the public interest. These television stations need to be clearly told that their silence and passivity is endangering humanity and it will not be tolerated. The climate movement should demand that television stations give climate change at least 500 hours of climate coverage in 2016. It should be a topic of daily focus and consideration, as well as a regular topic for in-depth reporting. Through its silence, television news is betraying us, and putting us in danger. Further, newspapers, magazines, and other media should be pressured to do in-depth reporting about the scale of the climate crisis and what an emergency climate mobilization would be like. Universities will be called upon to not only divest their endowments from fossil fuels and reinvest in renewables, but to openly acknowledge the existential nature of the climate crisis and need for emergency action, and to make the climate crisis the primary focus of curricula, research, and funding. New School University and United College have already taken similar steps. Thought Leaders and Leaders of Civil Society. If people in the public eye, and in the public esteem go into emergency mode, they will significantly influence the broader public. Staying in normal mode, however, contributes to inaction and passivity. “It’s not my issue” is unacceptable. Business leaders (e.g. Warren Buffet and Jeff Bezos), thought leaders (e.g. Paul Krugman and Ta-Nehisi Coates), community leaders, and religious leaders should also be invited – with an escalating degree of assertiveness – to learn more about the climate emergency and the need for climate mobilization. These invitations to leadership could include public challenges, social media campaigns, and potentially individually targeted disruptive protest. Fossil Fuel Infrastructure? Currently, the majority of climate protests and demonstrations take place at the site of fossil fuel projects, such as pipelines, oil trains, and export terminals. There is a certain intuitive logic in targeting fossil fuel infrastructure directly. However, I am skeptical about whether this is an ideal strategy for leading the public into emergency mode. These protests send a very clear, “NO!” message, but are unclear on the “Yes!”. Of course, the fossil fuel industry has been a terrible actor in helping to create the climate crisis, and they certainly deserve to be protested against. But if the goal is to bring the public into emergency mode, we need to focus on the way forward. We don’t want to just shut down one pipeline. We need to shut down all the pipelines, and we need to do it at emergency speed. And to do that, we need to engage Congress, the media, thought leaders, and the public. I assume that many activists will continue to be drawn to fossil fuel infrastructure protests. I recommend to them that they work as hard as possible to communicate the way forward (emergency mobilization off fossil fuels and carbon intensive agriculture, plus carbon drawdown to cool the earth back to a safe level) as much as possible in their verbal and non-verbal communications. This can be as simple as wearing Rosie the Riveter bandanas while protesting, displaying a banner demanding WWII-scale climate mobilization to restore a safe climate, and including the demand for net zero emissions by 2025, plus large-scale drawdown, in press releases and web materials. Strategic Evaluation: We Can Do This. In this paper, I have proposed a strategy for the climate movement based on my psychological and historical understanding of emergency mode. I have shown that our species can perform incredibly well when faced with emergencies, as long as we see a viable solution or a well organized effort to find a solution and feel that we can productively contribute to the solution. I have also shown that emergency mode is contagious, as long as we communicate clearly about the scale of the threat, and the mobilization we need. But on our side is the extremely potent truth — what science tells us and is becoming more apparent all the time — as well as the human desire to survive and protect other people and species. Another important strategic advantage is the WWII experience with the home front economic and social mobilization, which provides a recent historical example of extraordinary, improbable American success through mobilization. It’s hard for most people to imagine how we could possibly tackle the climate crisis because of the scale and urgency of what must be done — but the WWII-scale mobilization concept makes it much easier. Part of my confidence comes from The Climate Mobilization’s remarkable success as a volunteer-powered grassroots organization. In the year and a half since launching, we have experienced rapid growth, and exceptionally high dedication levels from our volunteers. We have organizers working across the country to educate their community about the need for climate mobilization; we have held events across the country calling for WWII-scale climate mobilization; we have recruited numerous elected leaders and candidates for Congress; finally, in this presidential election two candidates — Jill Stein (video) and Bernie Sanders (video) — have used that metaphor. The Climate Mobilization has had significant success with a tiny budget and constrained capacity — we’ve spent less than $100,000 since our launch in 2014 relying heavily on volunteers for all tasks. So imagine what would happen if larger, more established climate groups dropped gradualism, went into emergency mode and started fighting for emergency mobilization with large, experienced staffs and budgets— foundations give more than a billion dollars a year to climate organizations and projects—for major local organizing efforts, as well as advertising, video production, and more. They would experience major, continual growth in highly dedicated membership and power. Groups should invest in old fashioned, off line organizing—training and developing their membership, creating as many community leaders as possible, and working in as many different communities and sectors, as possible. The movement should take on more and more ambitious and large-scale emergency communication projects, continuing to build momentum behind the demand for emergency mobilization to restore a safe & stable climate. We are now in a time of tremendous consequence. Incredibly, our choices matter a great deal to the future of humanity and all life on earth. It’s time to leave gradualism, business as usual, and normal mode behind until we have solved the climate problem. The time has come to enter emergency mode. Enter Emergency Mode with The Climate Mobilization! We have a “Mobilize Yourself: Step-by-Step program that will help you develop your skills and impact. Larry Kramer: In Love and Anger. We are living in a state of planetary emergency. To have a chance of averting the collapse of civilization and the destruction of the natural world, we must mobilize our society on the scale of World War II to achieve net zero greenhouse gas emissions at wartime speed. The fact that we have already heated the world to such dangerous levels, and show little sign of stopping, is evidence of widespread institutional failure. We cannot expect anyone else to save us. We must organize to save ourselves. The Mainstream Environmental Movement: Avoiding Climate Truth. The aforementioned truth—while daunting and overwhelming— has the potential to be utterly transformative, for individuals, and for society as a whole. Yet it has been too often soft-pedaled by environmental organizations and communicators who advocate incrementalism over boldness, vagueness over specificity, and personal behavior change over systemic change. These strategies, in an attempt to be palatable and politically “realistic,” are abdicating the climate movement’s greatest strategic asset: the truth. Embracing the truth was at the heart of Gandhi’s Satyagraha campaign, the Civil Rights Movement, the Velvet Revolution, and the vast majority of triumphant social movements through history. The Emergency Climate Movement: Embracing Climate Truth. In recent months, a new, increasingly powerful segment of the climate movement has been taking shape. A coalition of those who openly recognize the existential threat of the climate crisis and advocate for a solution that is scientifically realistic and morally tenable: emergency mobilization. In other words, isolated actions such as the Obama Administration’s Clean Power Plan, putting a price on carbon, or even policies aiming for net zero emissions by 2050, are no longer sufficient. Perhaps if we had implemented these measures 30 years ago, they would have been adequate to maintain a safe climate. But that time has passed. Only emergency action—a mobilization of our entire economy and society—will protect us now. We must stop emissions in years, not decades. It is time to align our demands and language with the truth. Tom Weis followed up on that article by writing an open letter to President Obama, calling on him to set reducing US emissions to net zero by 2025—through an “all hands on deck societal mobilization at wartime speed” – as the US’s commitment in the upcoming UN climate talks in Paris. This letter is the single strongest display of public support for emergency climate mobilization that has ever been made. Signers include Lester Brown, Terry Tempest Williams, Mark Ruffalo, Ed Begley, Jr., David Suzuki, Winona LaDuke, Tim DeChristopher, Yeb Sano, Josh Fox, IPCC coordinating lead author Ove Hoegh-Guldberg the former chair of the Australian Coal Association, the founder of the Woods Hole Research Center, the founder of the Global Catholic Climate Movement, the founder of the New Evangelical Partnership for the Common Good, the former secretary of the California Environmental Protection Agency, and the four co-founders of The Climate Mobilization. I developed the idea for the Pledge to Mobilize—a denial-fighting, power-building tool—while earning my PhD in clinical psychology and working as a psychotherapist. Working with a team of co-founders, allies, and consultants all over the world, we turned an idea into a reality, and formed The Climate Mobilization. The Pledge is a one-page document that any American—and, since we have expanded internationally, anyone on earth—can sign, is a tool designed to help people fully face climate truth, and channel the deep emotions that arise into effective political engagement. The Pledge is a public acknowledgment that the climate crisis threatens the collapse of civilization, as well as call for the United States to initiate a WWII-scale climate mobilization to eliminate our national net greenhouse gas emissions by 2025 and enlist in an international effort to mobilize off fossil fuels and restore a safe global climate. The Pledge also contains a set of political and personal commitments. Signers agree to support elected officials and political candidates who have Pledged to Mobilize with their vote, as well as time or money, and to spread the truth of climate change, and the Pledge to Mobilize, to others. The Pledge encourages active hope and political empowerment. Using the WWII metaphor, we illustrate a time in which the United States successfully mobilized against an existential crisis. The Pledge challenges people to grow their awareness, cope with the reality, and become active agents for effective change by spreading climate truth and sharing the Pledge to Mobilize with others. The Pledge has also been gaining momentum with political candidates and elected officials. Recent signers include: Des Moines Mayor Frank Cowie, Iowa Legislator Dan Kelley, San Jose City Councilor Ash Kalra, Des Moines City Councilor Skip Moore, San Fransicso Mayoral candidate Amy Farah Weiss and Florida congressional candidate Alina Valdes. Councilman Ash Kalra and Mayoral candidate Amy Farah Weis can be seen taking the Pledge to Mobilize on video. We have recently started a Mobilize Iowa campaign in which we take the Pledge to Mobilize directly to the 2016 presidential candidates. Our current nation-wide initiative is the Moral Mobilization, which will run from now—coinciding with the Pope’s visit—through the Paris talks. The Moral Mobilization seeks to amplify and concretize Pope Francis’ message of “ecological conversion.” During Moral Mobilization events, community leaders will read from the Encyclical and publicly Pledge to Mobilize as they call on Congress, the White House, and all levels of government, to do the same. The Emergency Climate Movement is just getting started. We understand that everything we love is on the line, and that inaction or insufficient action will lead to unfathomable catastrophe. In response, we are redefining “realistic” to what is necessary and true. We hope you join us. 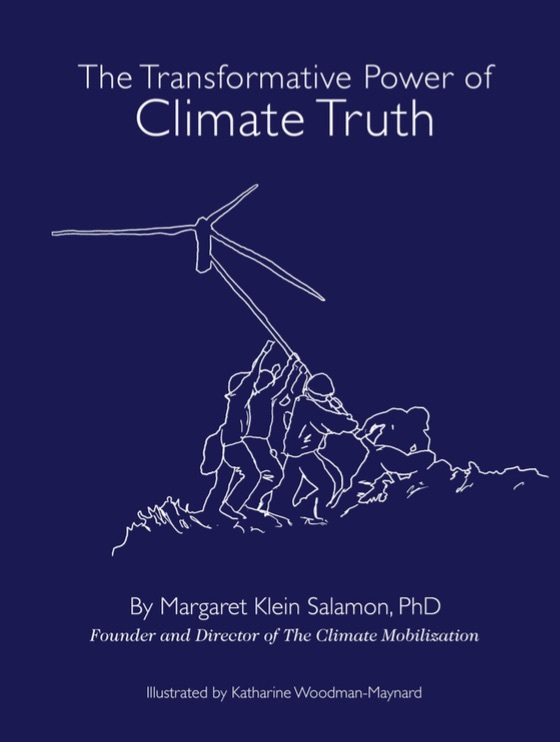 For a more in-depth version of these arguments, in a beautifully illustrated PDF, see The Climate Mobilization’s Manifesto: The Transformative Power of Climate Truth. For the scientific case for Emergency Mobilization see RECOUNT by David Spratt and the Case for Mobilization by Ezra Silk and Margaret Klein Salamon. When I say “Net zero emissions,” I mean that, it may not be possible to eliminate all US greenhouse gas emissions in the short timeline that The Climate Mobilization calls for. If so, the emissions that remain will be balanced out through carbon-negative techniques such as reforestation, permaculture, and biochar. This vision of “net zero emissions” does not include corporate land grabs or schemes in which the US discounts its own emissions through foreign carbon sequestration. Further, it is a stepping stone to the United States becoming net carbon negative, and also eliminating all remaining GHG emissions. For more information, see the Pledge to Mobilize or the Case for Mobilization. I am extremely pleased to announce The Transformative Power of Climate Truth, Illustrated Version! 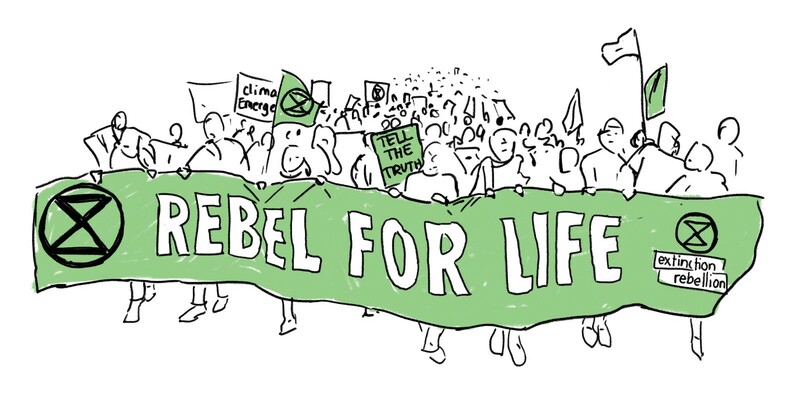 The main addition here are the beautiful illustrations and formatting are by Katharine Woodman-Maynard, The Climate Mobilization’s lead graphic designer. This version is updated to reflect recent events in The Climate Mobilization and in the climate movement more generally. The main addition is the description of the recent formation of a new segment of the climate movement, call it the “Mobilization Coalition”—a group of scientists, activists, and religious and community leaders—who are calling for emergency climate action. I am very proud and excited to say that this essay has helped incite transformation in some readers, helping them become more engaged, more active, more urgent, and more committed to the need for emergency mobilization. My hope is that this beautiful formatting will draw more readers to this essay, and further spread these personal and political transformations! So please help by sharing with those you care about and respect. Here’s the Media Release for the project I have been working on for the past few weeks, ObamasClimateLegacy.com. Add your name! Share widely! Open Letters to President Obama Champion Zero Emissions Goal at Paris Talks. Add Your Name. September 2, 2015 (New York City, NY) – As President Obama witnessed the dramatic effects of climate chaos in Alaska today, a distinguished group of scientists and environmental, faith, civic and cultural leaders challenged him to champion a courageous U.S. goal of net zero greenhouse gas emissions by 2025 at the upcoming climate talks in Paris. The challenge, issued in the form of an open letter, describes the current U.S. target of 26-28% emissions reductions by 2025 as a “weak” goal “that cannot be described as honest, courageous, or responsible in the face of a crisis that threatens the continued existence of humanity.” The letter also calls on the Obama administration to abandon its “all-of-the-above” energy policy. Notable signers include authors Lester Brown and Terry Tempest Williams; environmentalists David Suzuki, Winona LaDuke, Tim DeChristopher and Yeb Saño; actors Mark Ruffalo and Ed Begley, Jr.; filmmaker Josh Fox; musician Moby; and scientist Ove Hoegh-Guldberg, a coordinating lead author for the IPCC’s 5th Assessment Report. The letter reflects the views of growing numbers of scientists and climate leaders who are advocating dramatic, near-term carbon cuts over the carbon gradualism that has dominated the policy discourse to date. They say the world community has squandered the time available for a leisurely transition, and that an emergency mobilization is now needed to stave off climate catastrophe. “The Obama administration calls climate change a global threat on the scale of World War II, so why are they not responding with a World War II-scale emergency mobilization?” asked signer Margaret Klein Salamon, founder of The Climate Mobilization. “It is time to treat climate change like the existential threat it is and mobilize off of fossil fuels. “After seven years of half-measures and half-truths, the Paris climate talks will finally determine whether Obama’s legacy will be that of a climate champion who rose to the challenge of the climate crisis or a failure who was too scared to offer more than rhetoric and insufficient reforms,” said fossil fuel abolition activist Tim DeChristopher with the Climate Disobedience Center. To see the full text of the letter, and for more information, visit ObamasClimateLegacy.com. I have been very busy planning 6.14 National Climate Mobilization Day, in which Mobilizers in more than 15 US cities, as well as Paris and Mexico, demand WWII scale climate mobilization! Join us! Take the Pledge to Mobilize from me! I am very pleased that my Introduction to The Climate Mobilization presentation at Left Forum was captured by a talented citizen videographer Wilton Vought for his website “Other Voices, Other Choices” where he hosts the videos for download by public access TV channels. It is now available on The Climate Mobilization’s YouTube. I was interviewed about TCM by Alex Smith for Radio Ecoshock, which played on 87 college, independent, and commercial channels and is available for download. What is a Climate Mobilization? Since introducing the Pledge to Mobilize, I have received many of these questions about what, exactly, The Climate Mobilization is advocating, and whether or how it is compatible with other proposed climate solutions. Ezra Silk, deputy director of The Climate Mobilization and I have just published our most thorough answers to these questions to date. The Case for Mobilization is a 50-page document that uses bullet points and clear language to lay out the reasons why we are already in a climate emergency, and why national economic and social mobilization is the only way to fight climate change that can actually secure our civilization and democracy. It is the most comprehensive articulation yet of our vision. We hope that Mobilizers will find The Case for Mobilization useful in sharpening their arguments and recruiting efforts, and that interested or skeptical people will read this document to understand what TCM is all about. Please take a look. Constructive comments and feedback on this document are very welcome! Thank you to Michael Hoexter and Philip Sutton for invaluable input. We’re facing a global emergency, but the great majority of Americans are acting as though everything is fine. The Climate Mobilization is creating tools and props to help each of us intervene in the trance of collective denial in our daily lives. As I elaborated in my recent article in Common Dreams, climate change creates a situation of “pluralistic ignorance,” in which we all look to each other to determine whether there is a crisis that we should react to, and because we see each other acting calm and normal, we determine that there isn’t one. If we are to instigate the society-wide crisis response that is necessary, we need to collectively accept that we are, in fact, in a crisis — and then decide how to act on it beyond just shifting our consumer choices. The Pledge to Mobilize is a tool to empower individuals to accelerate this collective awakening into an effective political response. It incorporates many psychological principles (the power of relationships, the power of public commitments, and the hope of a viable comprehensive solution) that fight denial. But conversations about the climate crisis can be uncomfortable, and unless you’re surrounded by people who are highly informed about it, it can be tough to figure out how to spark meaningful conversations in a way that feels natural. So we’re suggesting a few “props” that can supplement outreach efforts, and help cut through climate denial, minimization, and silence with people in our daily lives. All of these props are meant to start conversations specifically about the climate crisis, and how YOU and the people around you can be an integral part of building a large-scale mobilization against it. These ideas can also be modified by people who like the idea but don’t want to promote the Pledge to Mobilize specifically. “Are you concerned that climate change threatens the collapse of civilization? If so, lets talk about the way forward, and the crucial role that you can play in creating a safe and stable future. Using this type of inviting yet blunt signature can cause many people to stop and think. It may make some uncomfortable, but it also creates an opportunity for them to engage further. I encourage anyone who’s alarmed about climate change to create an email signature that works for you! Any TCM member can personalize and order these cards. With your personal info on the back and a bold statement of climate truth on the front, these are sure to inspire a reaction, which can hopefully lead to a meaningful conversation! If you want to order these, let me know and I will add you to the list of people who can access them. When attending political events (or just in daily life), you can be a walking advertisement for climate change awareness and The Climate Mobilization with this t-shirt, available from UberPrints. A book (the old fashioned kind) can be a great conversation-starter with someone who’s intrigued to see you reading it. Of course there are many more that are worth reading — we’re working on compiling a longer list of books that I highly recommend, with notes about how each one relates specifically to The Climate Mobilization’s mission. We will continue to develop props to assist Mobilizers’ efforts at spreading climate truth and the Pledge to Mobilize. What materials would be helpful to you in your personal mobilization? I think the next thing to develop will be a bumper sticker. If you have ideas for how to phrase one (…perhaps addressing the apparent contradiction between driving and fighting climate change), let us know!